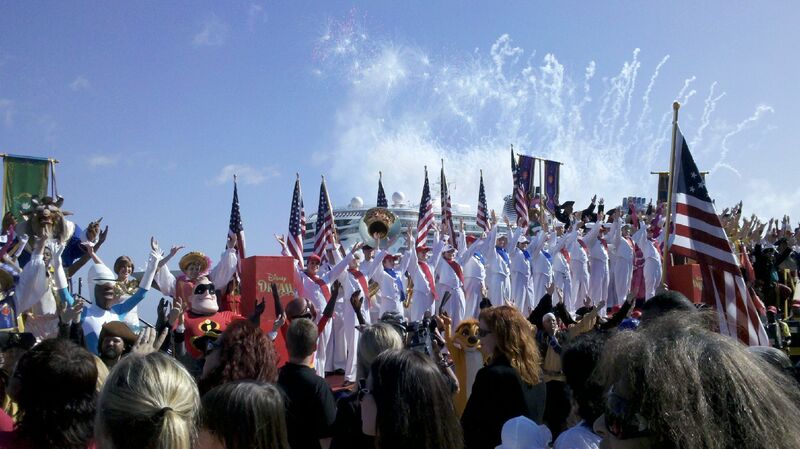 Doing things better than most, the Disney company today launched their newest ship, Disney Dream. With a cast of dozens representing Disney characters from their greatest hits -, Aladdin, Nemo, Buzz Lightyear, Belle, Cinderella and more -, the christening show hit touch points with everyone in the audience. And Disney knows that its audience is more diverse than ever. It’s unusual at a cruise event to see so many reporters for African American, Asian, Indian and gay publications, but a love for all things Disney has no bounds. A naval marching band from Jacksonville led a tribute of flags from every nation represented by the Dream’s crew. Others appreciated watching Mickey Mouse, the shop’s icon, come out in a glitter hoodie and dance his paws off to a hip hop request for dreams to fill the requisite champagne bottle. Pirates came out to promise a voyage of adventure and Rapunzel urged us to break out of our little worlds. Magical and fun at the same time, making kids, journalists, mom bloggers, and grandparents entertained. The ship looks beautiful, the cruise experience is likely to be flawless, but what I’m struck by is how much imagination, energy and quality goes into everything Disney does.